Western Electric manufactured several different types of two-piece (separate transmitter and receiver) metal wall telephones between 1910 and 1946. Pictured here is the 653 antisidetone dial wall telephone, equipped with a 635A "Bulldog" transmitter and 706 receiver, both of which contained the same elements as the F1 handset. The C1 was manufactured from about 1930 until 1937. The Bell System code for the C1 was 101 when it was used with a sidetone subscriber set, and 201 when it was used with an antisidetone subscriber set. 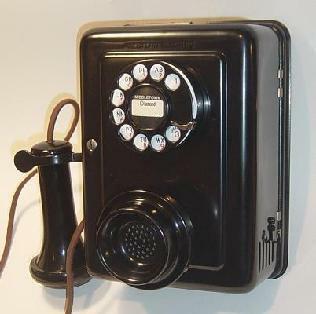 The G1 handset mounting replaced the C1 in 1937. It had a square housing that made it more versitile for mounting. The earliest G1 dial mountings had a type 41A dial mount that allowed the dial to be positioned in any one of eight different ways, but the angle of the dial was fixed. The type 43A dial mount, introduced later on, allowed the dial to also be positioned at several different angles. The earliest G1 telephones were coded 211 by the Bell System. But in the over forty years that this style of handset telephone remained in production, they were offered as G1 through G7 handset mountings, each with a different contact assembly and a different Bell System 2XX code, depending upon the application. 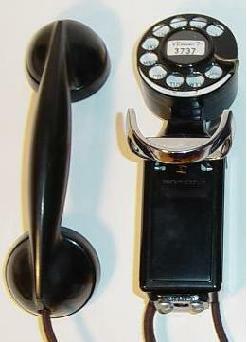 The 354 was Western Electric's first regular production self-contained handset wall telephone. The 354 was the equivalent of the 304 desk telephone, which was used for various party line applications as well as for individual lines. 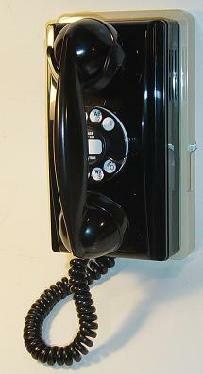 The 354 wall telephone was manufactured new from 1947 to 1956, when it was replaced by the 554 wall telephone.